He has visited the Antarctic on four separate occasions and worked in sub-Antarctic islands such as South Georgia and the Falkland Islands. The main themes were the human geographies of exploration, discovery, resource exploitation and governance. I also touched upon the physical geographies of the polar continent and Southern Ocean with some description of animals such as penguins and whales. The main thrust of the book was to unsettle taken for granted assumptions about the Antarctic and I suspect it empowered by a reaction against the dominant representations of the continent as a nature reserve and or a space to resurrect the past deeds of polar explorers. I wanted to take readers on a contemporary tour of the region with due weight given to geopolitical machinations, resource exploitation and the growing commercialization of the continent and ocean. By analysing contemporary developments especially focussing on the workings of the Antarctic Treaty System, and examining some of the unfolding tensions surrounding the continent – such as China’s growing profile in the region. The book makes reference to treaties, protocols, media reporting and campaigning. 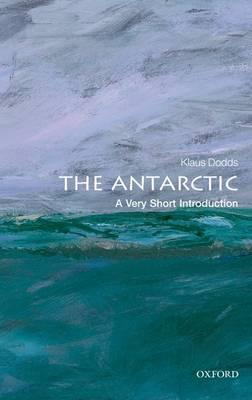 The book was a very short introduction to the Antarctic so there it is expected to reach out to academic and non-academic audiences. It is meant to be a synthesis as well a provide a clear argument which is in this case one that focussed on the Antarctic as a deeply contested and increasingly commercialised space. I hope the book will inspire general readers in particular to take a new interest in the Antarctic and one that is more attentive to resource and territorial issues rather than one based on an interest in exploration and wildlife. This is my second VSI and it reinforces a desire on my part, as I complete 20 years of work experience in higher education, to write for more popular audiences. While I will always seek to publish in our academic journals, increasingly I want to write more for policy-orientated and public audiences. I think there is a continued need to investigate carefully the workings of the Antarctic Treaty System and associated legal instruments. We should not take it for granted that the governance of the Antarctic is assured. There is mounting interest in Antarctic resources, there is more effort being devoted to securing sovereignty and there is likely to be greater tension over who shapes the future of this continent in the midst of continued anxieties about a continent that is warming, melting and disintegrating.